Which is the smarter bet on a growing housing market? A multiyear rebound in the home improvement market has benefited few companies as much as Home Depot (NYSE:HD) and Sherwin-Williams (NYSE:SHW). Both stocks are up nearly 300% over the past five years, compared to an 85% gain for the broader market. Their performances have been closer over the past year as well, with each stock rising about 10%, or right in line with the market. Yet these are far from interchangeable investments. Their business trends and finances differ in some important ways that could make one a preferable investment over the other right now. Data sources: Company financial filings and S&P Global Market Intelligence. Sales growth is for the past complete fiscal year. Home Depot has seen stronger overall sales growth for two key reasons. First, the retailer has done a great job at stealing market share both from smaller rivals and from its chief national competitor, Lowe's (NYSE:LOW). Comparable-store sales were up 6%, 5%, and 7% in 2015, 2014, and 2013, respectively, while Lowe's results were below 5% in each of those years. The breadth of Home Depot's outperformance vs. competitors' is hard to overstate, in fact. Its customer traffic trends, profitability, and return on invested capital have all significantly outpaced Lowe's results. Second, Home Depot's business is much more concentrated on the U.S. market and so its numbers haven't been pinched by foreign currency swings and by uneven economic growth in other areas of the world. Sherwin-Williams' international division posted a 2% decline over the last six months, which offset solid growth in its U.S. retailing operations. In contrast, Home Depot has enjoyed broad-based growth across each of its domestic regions. On the other hand, Sherwin-Williams' record on profitability is better than Home Depot's. Gross profit margin for the paint producer was 51% of sales last year, compared to Home Depot's 34%. Sherwin-Williams' more comparable rival (and acquisition target) Valspar is also far behind, at 34% of sales. What's more, Sherwin-Williams' profitability has made impressive strides higher lately, with gross margin improving by two percentage points over the last six months. 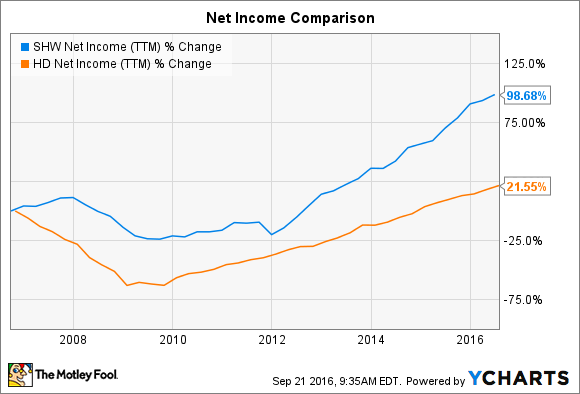 As a result, net income has grown at a faster pace, roughly doubling over the last 10 years -- compared to Home Depot's 22% rise. SHW Net Income (TTM) data by YCharts. Both companies have demonstrated the ability and willingness to return significant chunks of cash to shareholders. Sherwin-Williams' recent 25% dividend boost (compared to Home Depot's 17%) reflected its higher earnings growth pace. However, Home Depot dedicates a larger portion of its cash flow to dividends due to the fact that it is satisfied with its overall square footage and isn't spending aggressively to expand the store footprint. It yields a more substantial 2.2% that's roughly in line with the broader market's payout. Both companies have a long track record of raises, although Sherwin-Williams' streak of boosts, unlike Home Depot's, survived the housing market crisis intact. Still, the home improvement retailer looks like the stronger investment here, given its cheaper valuation and impressive history of winning market share while outperforming rivals across key business metrics. Investors who would prefer a smaller yet more global business with room to grow its physical presence, meanwhile, should take a closer look at the highly profitable Sherwin-Williams.